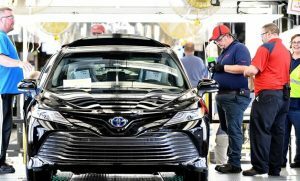 On Friday, President Donald Trump pressured automakers in the U.S. to build more of their vehicles in the United States and launched another new attack on the North American Free Trade Agreement, which has been beneficial to automakers. At the same time, companies urged the president to work with officials in California to keep nationwide vehicle emissions standards. CEOs or top executives from 10 automakers, both U.S. and foreign, met with the president for approximately one hour as the Department of Transportation considers untightening federal fuel efficiency as well as pollution standards that were implemented under former President Barack Obama. Following the meeting, a pair of top trade groups from the auto industry said that Trump has expressed his openness to talking with California. State officials in California and 16 other states covering almost 40% of the population of the U.S. filed suit last week attempting to block the White House’s efforts to weaken the requirements for fuel efficiency. A U.S. Department of Transportation proposal would freeze requirements at levels set for 2020 through the end of 2026, instead of allowing them to continue to increase as was planned. The White House is expected to unveil its proposal formally later in May or early June. CEO from Ford Motor, General Motors, as well as Fiat Chrysler, and senior executive in the U.S. from Toyota, Volkswagen, Hyundai, Nissan, Honda, BMW and Daimler met with the president, as did two heads from a pair of trade groups. Trump told those attending that the country is importing many cars and the White House wants those vehicles to be made in the U.S., adding they could be made in places such as Michigan, Pennsylvania, Ohio, North Carolina and South Carolina. Automakers are asking the White House to meet with California to come to an agreement on keeping national standards fearing a long battle in court could leave automakers facing two distinctly different rules. Much of the meeting of one-hour focused on the renegotiations of NAFTA and other types of trade issues. Trump blasted the agreement. Trump said the trade pact was being renegotiated and that Canada and Mexico did not want to lose their golden goose. However, Trump added that NAFTA has been nothing more than a horrible disaster for the U.S., but automakers have said NAFTA has been a success.